Matt Baker, Anita Rani and Helen Skelton tell the story of cattle in this themed programme. Matt spends the day with a young beef farmer. Matt Baker, Anita Rani and Helen Skelton tell the story of cattle in this themed programme. Matt spends the day with young farmer Jack Stilwel, who got into farming after a crowdfunding campaign on social media. Matt finds out what made him take the plunge and what the reality is for beef farmers in the 21st century. Helen visits the last remaining traditional oak bark tannery in Britain, discovering the processes that go into producing high-quality leather. Anita meets botanical artist Gael Sellwood who paints on vellum. Anita finds out what makes vellum so good to paint on and picks up a paintbrush herself. Anita also finds out what's behind the current craze for raw milk, meeting a young couple who can't sell it fast enough, and asks if it is just a food fad or if there are health benefits to drinking it. Many of Britain's dairy farmers are struggling to make ends meet at the moment because of falling milk prices. So what can be done to help them back into profit? Charlotte Smith asks if large indoor dairy herds are a more efficient way of making money from milk and whether the British public would support them. Matt meets Jack Stilwell a self-confessed cattle geek, now twenty five Jack has always wanted to be a beef farmer and he’s succeeded in a most unusual way. Matt finds out how Jack took to social media to raise the funds he needed. With some crowd funding money behind him he has put together his herd of 200 Angus and Hereford beef cattle. Matt spends the day on Jack’s farm and meets some of his prized cattle that are set for the local auction. Finally after a long winter indoors Jack's cattle are to be turned out onto the new spring grass. Charlotte investigates what some dairy farmers are doing in the face of falling prices. She meets up with Neil Baker, his herd of 1700 cattle live inside all year round. Neil is so confident in the welfare of his herd he invites Phil Brooke from Compassion In World Farming to have a look around. Charlotte then catches up with Neil Darwent and looks into the idea of free-range milk, which Neil hopes could soon become a regular sight on our supermarket shelves. Did you know that here in the UK we still print our laws on vellum? There are just three known Vellum manufacturers left worldwide. Anita chats with Paul Wright who manages William Cowley Parchment Makers, the only Vellum manufacturer in the UK. Anita discusses the whole process from selecting the right calf skin all the way to treating and removing layers. Anita also meets Gael Sellwood, a renowned Botanical Artist, who talks about the reasons why she uses vellum. Find out why we still print our laws on vellum. Adam Henson and Charlotte Smith are in Cumbria meeting some farming heroes – lots of them! 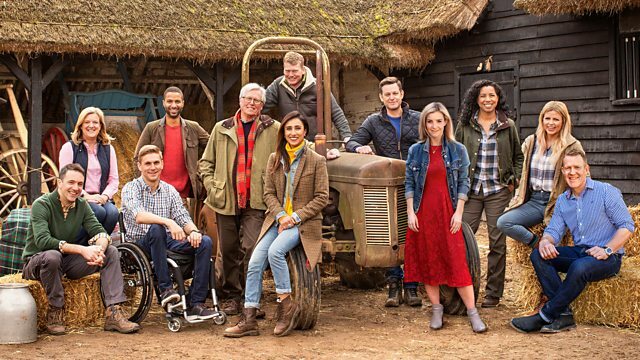 They are judging finalists in this year’s Countryfile Farming Heroes Award - which pays tribute to people who go out of their way to do good work in their farming community. The first nominees are the entire Federation of Cumbria Young Farmers’ Clubs, all 25 clubs … that’s 1,600 young men and women. Adam and Charlotte meet some of the young people who came to the rescue of farmers and livestock affected by the Cumbria floods in December last year. And they hear that when Storm Desmond flooded Carlisle, the farmers saddled up and took their tractors into the city to help out there too – time for Adam to join a convoy!. The awards are part of the BBC’s Food and Farming Awards. The winner will be announced on April 28th at the Bristol Food Connections Festival, and will appear on Countryfile on Sunday May 8th. For thousands of years we have used hides for clothing and footwear, but how long does it take to produce these items? Helen visits the last traditional oak bark tannery in Britain to discover how they turn raw cow hide into premium grade leather. Helen meets Andrew Parr to examine the whole process from scraping off the hair, soaking it in oak bark vats to finally finishing and grading. Along the way Helen meets John Hagger a master leather worker who uses the leather to produce fine hand-crafted goods. Unpasteurised milk known as ‘Raw Milk’ has grown in popularity over the past few years. Anita joins Jonny Crickmore in the early hours of the morning to help get his herd of rare Montbeliarde cattle in for milking. Jonny is one of many dairy farmers who are now changing how they produce milk, he talks Anita through the process of how he began this project, even down to the selection of the perfect breed. Anita and Jonny also look at the health benefits suggested by his customers and examine the recent scares of E-coli and Listeria.